Salmonella is an important cause of foodborne illness in Canada. Each year, approximately 88,000 people become sick from consuming food that is contaminated with Salmonella. Foods such as fresh fruits and vegetables have recently emerged as important sources of Salmonella because they are grown in soil, where contamination due to animals and non-potable water can occur. Problems associated with Salmonella will be addressed through the development of natural solutions to control the presence of Salmonella on fruits and vegetables as they are growing in the field. 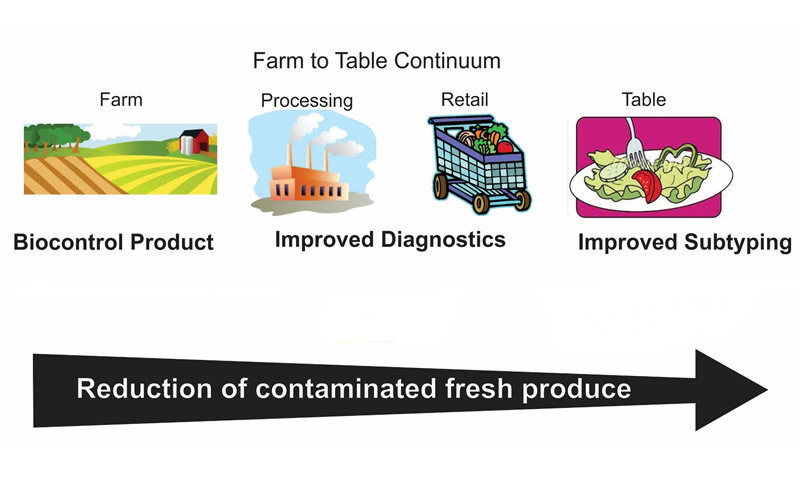 New tests will also be developed so that fresh produce can be quickly and efficiently tested for the presence of Salmonella before being sold to consumers. New tools will be developed to allow public health officials to better determine the source of Salmonella illnesses when they occur, which will allow for contaminated food to be removed from grocery stores faster. The cost of foodborne diseases caused by Salmonella is estimated to be as high as $1 billion annually in Canada. Cécile Tremblay, Florence Doualla-Bell, LSPQ.